Cork midfielder Denise O’Sullivan has joined Canberra United as the club’s guest player for 2018/19. O'Sullivan celebrates winning the National Women's Soccer League in September. FRESH OFF HELPING North Carolina Courage claim the National Women’s Soccer League in the United States, Ireland international Denise O’Sullivan will make a switch Down Under. The Cork native has signed a deal with Australian side Canberra United in the nation’s capital, joining as a guest player. O’Sullivan enjoyed one of her most successful seasons to date in 2018, helping NC Courage to a league title, as well as being named her side’s Most Valuable Player (MVP) for her commanding performances in midfield. Last month she helped the US side to a 3-0 victory over Portland Thorns to secure the title, meaning O’Sullivan had claimed league championships in all of Ireland, Scotland, and the United States. The 24-year-old Cork native joined the club in July 2017 following stays at Peamount United, Cork City and Glasgow City, moving to North Carolina following one season with Houstan Dash. Australia becomes the fourth country the 24-year-old Ireland international has played in since 2011. “Delighted to have signed with @CanberraUnited as a guest player for the @WLeague 2018/19 season. Excited for this opportunity,” the player tweeted on Thursday. O’Sullivan has made over 60 appearances for Ireland since making her international debut in 2011, with the player arriving in Canberra this week. 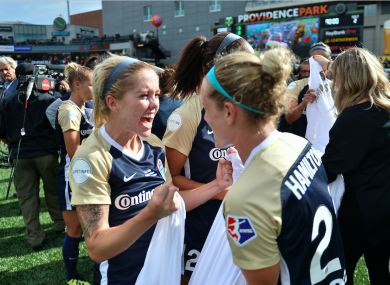 O'Sullivan won a league title win NC Courage in 2018 and was named the club's MVP. The midfielder said she hoped to build on her league-winning campaign in North Carolina earlier this year. “This season has been amazing with the Courage,” she said, “and I’m hoping to bring my form and continue it here, and to test myself in another major league. “I have been a part of the senior national team since I was 17 years old and have played for a number of clubs as well. Email “Down Under! Ireland international O'Sullivan seals move to Australia after stellar campaign in North Carolina”. Feedback on “Down Under! Ireland international O'Sullivan seals move to Australia after stellar campaign in North Carolina”.